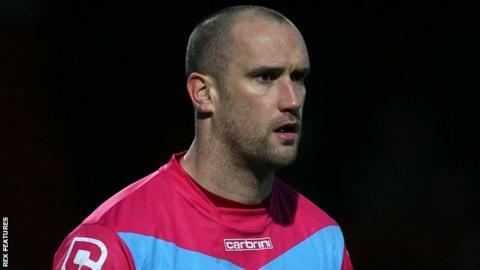 Morecambe keeper Barry Roche says his 93rd-minute equaliser against Portsmouth was better than any "top corner or penalty save" of his career. The 33-year-old headed home Shaun Miller's corner to earn a dramatic late point for the Shrimps. "I didn't have a clue how to celebrate. I thought about doing a Klinsmann, but the pitch was too dry," he said. "I jumped and then there was the pile-on of all pile-ons. I couldn't breathe so I had to throw a few off me." Despite deciding against replicating Jurgen Klinsmann's 1994 pitch-diving celebration for Tottenham, Roche reflected on his equaliser with pride. "Speaking to the boys, it's better than a top-corner save or a penalty save," he told BBC Radio Lancashire. "Usually when I go up for corners, I stand in front of the keeper and make a little movement there. I said to myself, if it happens I won't do that. "The centre-half is picking me up and as soon as I've run, I thought 'that ball is mine' and I don't think he followed me so I managed to get a head on it." Despite his moment of glory, Roche hopes he will not have to try to repeat his goal-scoring feat any time soon. "I'm quite happy to stay in my own goal - that will do for me," he added. "I'll be more than happy to be in a leading position so I can stay back."